My training started in 1990 while I was attending high school. I found a Mudo-Kwan Tae Kwon Do school and convinced a friend to train with me. This training lasted for 2 years, until my instructor moved away and I was forced to find a new school. I then began training in Olympic-style Tae Kwon Do in a nearby town. This is where I grew my foundation and advanced to 2nd Dan Black Belt. I opened my own school back in my hometown after my 1st Dan promotion in 1997, then later sold this school to a Tae Kwon Do classmate in 2001 and moved to Sarasota, Florida. 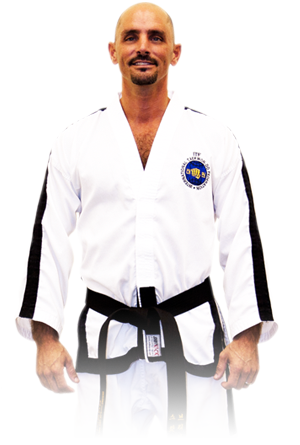 Once arriving in Florida, I started training under Master Instructor Pete Thibado and formed another school at the YMCA. My training with Master Thibado has enabled me to become a Certified International Tae Kwon Do Instructor at the rank of 4th Dan Black Belt. I became interested in Martial Arts training after watching the movies of the late 80′s. Like many young kids, I could watch the same action movie over and over. I was hooked and had to try some form of Martial Arts. The excitement and feeling of accomplishment has kept me involved in Tae Kwon Do for the past 21 years. Now, after teaching for 15 years, I get the same excitement and feeling of accomplishment teaching my own students and participating as an instructor, referee, or judge at Martial Arts events. My Tae Kwon Do journey has been a wonderful experience and I am looking forward to the future of my training and teaching, as the students will experience their own journey and learn to express themselves to the best of their ability. As Tae Kwon Do is continually being developed and improved, it is my best interest to understand this unarmed combat and scientific use of the body; this will ensure the best results from the students and maintain the best level of instruction possible. Together we are building keen minds and strong individuals, both mentally and physically. The knowledge I have to share and pass down is from the original and traditional form of Tae Kwon Do. As we strive to be the best at West Coast Martial Arts Academy, we strive to protect life’s most valuable asset…GOOD HEALTH. This entry was posted in THIS IS NOT FOR NEWS. Bookmark the permalink.